Olives are harvested on the Chinnery’s land in New Zealand. 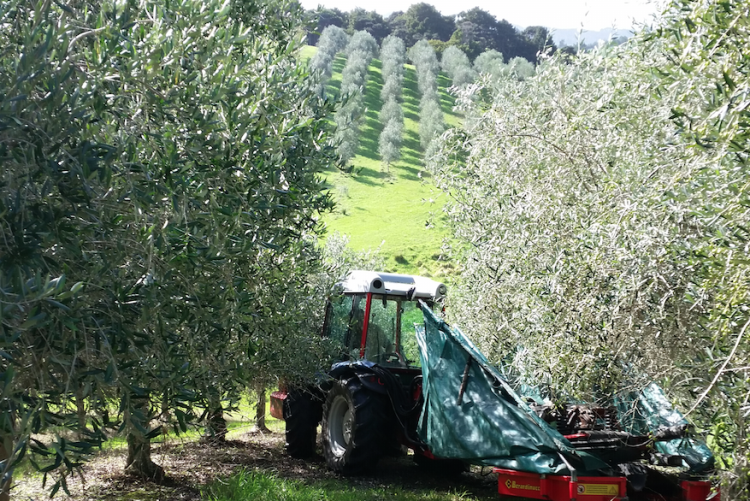 In Mangawhai, located in the New Zealand countryside, lies a beautiful olive grove. This grove is the site of a family-run business that plants, grows, and harvests these olives and then uses them to manufacture premium quality extra virgin olive oil. This is the home of Divinity Olives, a company run by married couple Michael and Leanne Chinnery. The business, which also makes their own balsamic vinegar and strawberry compote, is streamlined and focused; with a small number of products and an even smaller team, the quality of the product takes top priority. Divinity currently sells their products in over 50 stores and online, and business is growing. I spoke with Michael about their experience, of raising their three kids while being entrepreneurs; and for Michael, of holding down a full-time day job as well. He also recounts which decisions were instrumental in his success, and what inspires him about not just the olive oil business, but New Zealand entrepreneurship in general. Michael bought the land and planted his olive grove originally as an investment in the property market. Shortly afterwards, he met his future wife Leanne, and they discussed business possibilities for the olives, with the understanding that nothing would be actionable for at least four years while the olives matured. But of course, time flies. They considered what they wanted their brand to be like: clean, pure, classy. From these ideas they came up with “Divinity Olives,” a name that encapsulates all these characteristics. Michael has a degree in business ethics, so he had some experience and generally knew the ropes. Still, he looked to his fellow small business owners for inspiration. “The degree gives you a lot of insights on how to do things, but then you’ve got to apply that to the real world,” he says. “It’s just my wife and I,” Michael confirms. Aside from the commercial olive harvesters they contract in, Divinity is a family business. “We used to do that [harvest olives] by hand, ourselves and with friends and family, but they got tired of us,” he says with a laugh. With three small kids, two other properties to maintain, and a day job as a CFO for a hotel chain, it’s a busy life for Michael and Leanne. Echoing many small business owners, the Chinnery’s biggest challenges have been maintaining cash flow and not overextending themselves. “Time has always been our biggest problem,” Michael notes, saying that when you’re a small operation, not having a enough time to invest in the business can limit its growth. Cash flow has sometimes been tight because the Chinnerys have never taken money from a bank, but that may need to change as they expand. 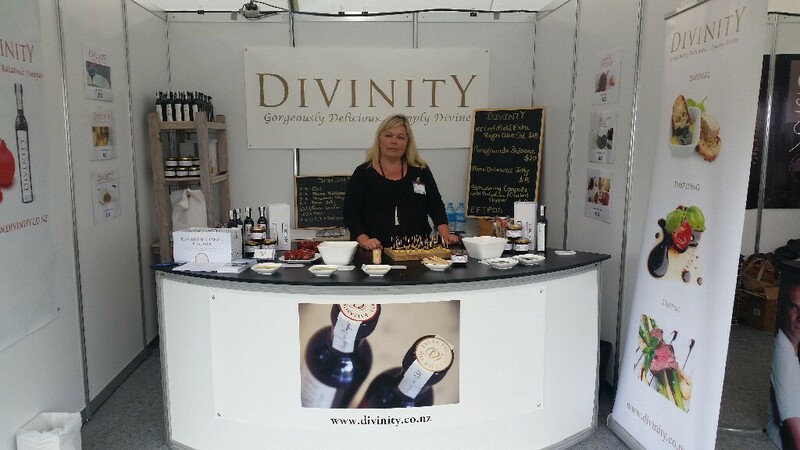 Leanne Chinnery at an industry event showcasing Divinity Olives products. Using LivePlan, the most important metric that Michael tracks is their cost of sales. After realizing they could make a key product—their balsamic vinegar—by themselves for less money and with higher quality, Michael saw it as an opportunity to cut their cost of sales and make room for growth. What’s in the Divinity Olives toolkit? Xero: Michael describes their use of this software as “general accounting, invoicing, AP and AR and month and year end reporting.” It connects to the LivePlan software as well. Airsquare: Airsquare is a platform they use for “website design and hosting, eCommerce, invoice generation, online payment management and inventory control,” Michael says. Agile CRM: Agile CRM is Divinity Olives’ preferred customer relationship management software. LivePlan: For business and financial planning. “The thing I look at the most is our cost of sales,” Michael says. What’s the secret to your success? “Balance is one part of it. Sometimes we slow the business down because we want to have balance in our lives. You’ve got to make the job, the business, enjoyable. Occasionally you fall out of love with your business, but then you’ve got to find ways to fall back in love with your business again. You have to have some time out and refocus again. What has helped your business become successful? Share your experiences with us in the comments.